UltraVNC, as their site shouts, offers "Remote Control Software for all", well at least for all PC (Windows) users! Being a programmer, and thus have all the available tools, I downloaded the 'Ultr@VNC 1.0.2 Source code archive' zipped source from http://www.uvnc.com/download/index.html and set about compiling it myself. 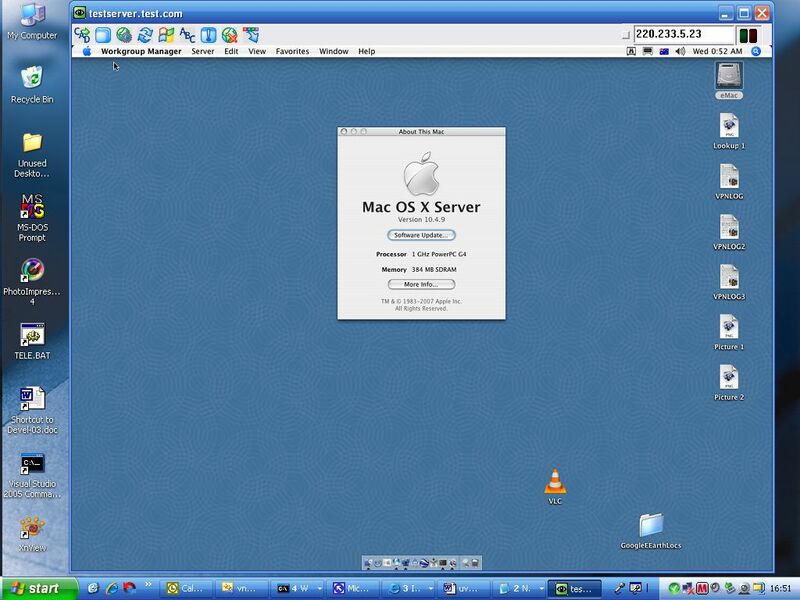 Since I wanted to connect to an Apple machine, running xserver, which already has an Apple Remote Desktop VNC Server, I only compiled the vncviewer from that source. Initially, it would NOT stay connected. After connection and authentication, the initial video screen would commence to arrive, then it would abort, indicating error number 10054. The WinError.h file indicates this is 'An existing connection was forcibly closed by the remote host.'. Why was the 'host' closing the connection? I enabled the file log, increased the messages to the file log, and add a DumpHex log service, to track down this problems. It happened consistently while the read thread was reading the first screen update. The vncviewer was sending a second pixel format and encoding message to the MAC VNC Server, and thereafter the MAC would close, thus the vncviewer would ABORT. However, despite the good broadband speeds, the VNC Viewer Status window only showed 33-67 kbit/s, using XORZlib, Cache encoder. Of course it all worked BEST in my fastest machine, a Dell Dimension DXP061, with an Intel Core 2 CPU 6400 at 2.13Ghz, running XP Media Center Edition. It also ran, in an XP Pro machine, with Pentium 4 CPU at 3.00 GHz, and a much older Windows 98 machine, although in this latter machine there were some small screen image aberrations sometimes. Of course I would fully recommend you download and use the binaries (EXE) provided on the official UltraVNC site, but if you really wish to try my compiled version, then download, and unpack this zip (MD5 5d840d78b1721dfe0ba8064a1e672afa). Always be WARNED of running EXE files from the WEB. And this text file (uvncdiff.txt) contains a diff to the 1.0.2 vncviewer source, should you want to compile you own from my modified source.